Did you remember that this IS the weekend to set our clocks back? If you want to stay up and do it on the official hour it is 2 a.m. Sunday morning…me? I won’t even be home to change the clocks! According to Greenwichmeantime.com daylight savings time was first proposed by William Willet in 1906 though the idea was rejected until it became a war measures act in the UK in 1916. According to yourdictionary.com the idea was Benjamin Franklin who wrote about the idea of “free light” (ie. sunlight) vs the cost of lighting a house with candles or lamps in 1784. Of course the truth is that it was an idea considered by many but implemented fully by 1918. We’ve had it ever since…except in Saskatchewan…but that’s another story! Speaking of stories – have I told you of the time that Wendy and I were in Ottawa for the dedication of our niece Meghan? The night before the family was all together when someone said “isn’t this the night we put our clocks back?” …there seemed to be consent and so that night before we went to sleep in our hotel room we put our watches back and agreed that we would grab breakfast at McD’s. The next morning we noticed that McD’s hadn’t reset their clocks. We began to wonder …but of course put it down to the number of teens working…”they just haven’t done it yet”. Then a sense of doubt crept into our minds…and a mad dash was made to the church where we discovered the service was underway and we had made it just in time! Whew….one of those “I can’t believe that happened” stories. 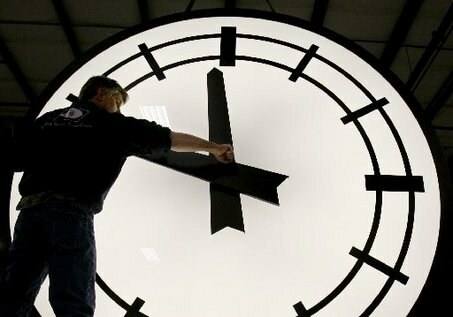 November 7 is the date we put our clocks back for 2010!